General Topics & Doctrine | The Case for a Creator: A Journalist Investigates Scientific Evidence That Points Toward God | Watchman Fellowship, Inc.
Are Christianity and science incompatible? If there is a God, is he only an impersonal starter force? 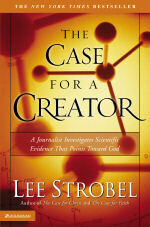 An introductory high school biology class first propelled Lee Strobel toward a life of atheism. God and science, he reasoned, were mutually exclusive. When the former legal editor of the Chicago Tribune converted to Christianity, he decided to investigate the science he had once accepted as truth. Did science point toward or away from God? As Strobel interviews a variety of scientists on everything from debunking evolutionary icons to the implications of the Big Bang to the existence of the human soul, he builds his case: scientific evidence points toward Intelligent Design. Although the discussion often veers into the academic, Strobel works hard to make it accessible to those without scientific training. Throughout the book, he salts interview transcript information with interesting personal stories of his own spiritual and scientific quest for knowledge, as well as sometimes over-detailed descriptions of the actual interviews (right down to the type of beverages consumed). Each chapter contains suggestions for further reading on particular issues of science and faith. Strobel concludes that, when correctly interpreted, science and biblical teaching support each other. He quotes physicist Paul Davies, "&science offers a surer path to God than religion." Open-minded readers will find that this book, and its questions for reflection and group study, invites conversation and investigation.